Have you found yourself locked out of your home or vehicle, or are you ready to explore the latest in home security technology? At Black Hawk Lock & Key, we specialize in providing a full array of security solutions for the homes and businesses of Penfield. We have a mobile locksmith service, meaning that we can meet you wherever you are to provide outstanding convenience and friendly, high-quality service. Not all locksmiths are equal. Some have undergone extensive and ongoing training, enabling them to safely and efficiently install or pick nearly any lock without causing damage to the lock hardware or the door. Other locksmiths, however, haven’t received any formal training at all; they’ve learned through a combination of trial and error and online explainer videos. These scammers often lure customers in with low upfront prices, only to tag on hidden fees when it’s time to settle the bill. Because they’re often unable to safely pick a lock, they may claim that the lock can’t be picked and instead must be broken. To make matters worse, they usually don’t carry insurance, leaving the customer with a surprisingly high bill and a compromised lock that will cost money to repair or replace. 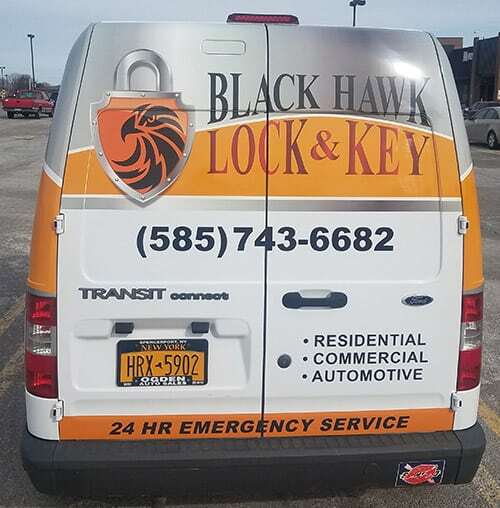 At Black Hawk Lock & Key, we take pride in offering service of the highest quality to the homeowners, drivers, and business owners of Penfield. We are the locksmith Penfield, NY residents trust with their locks, and we strive to provide outstanding value and professionalism with every job. We are certified members of both 1800unlocks and the Fair Trade Locksmith Directory, meaning that we have been carefully screened to ensure that we are licensed, insured, and in good standing. Our locksmiths have received thorough and ongoing training and have experience in working with numerous types of locks and security systems. If you have a locksmith emergency or you want to update the locks on your home, vehicle, or business, then give us a call. We’re here to help you, no matter how simple or complicated your needs.